Benches are always memorable and trendy additions to your garden and fun outdoor places! Nothing else can serve best for comfortable sitting in your garden but benches! Benches are made in so different mediums but wood medium has always been best for each type of indoor or outdoor furniture! Do you really want to create an instant decorative and cozy vibe to your garden? 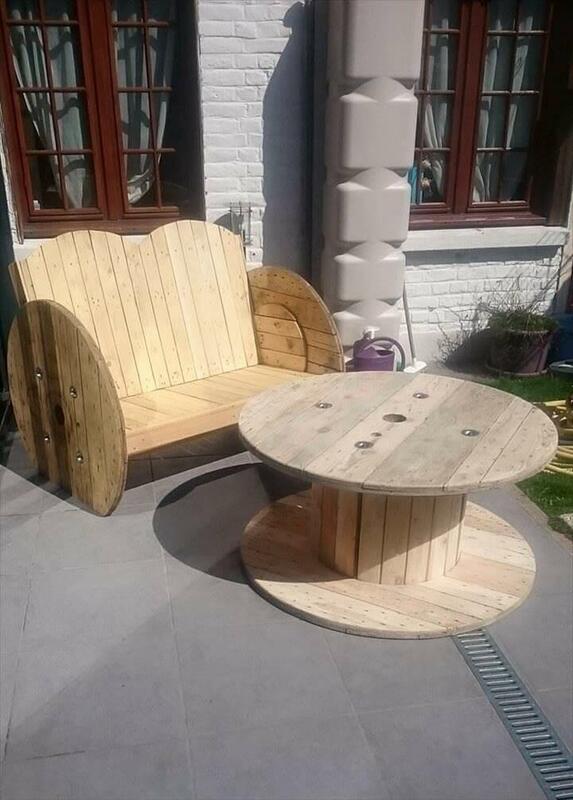 Add this no-cost DIY pallet and cable spool bench to your garden and enjoy great sitting with your friends and colleagues! 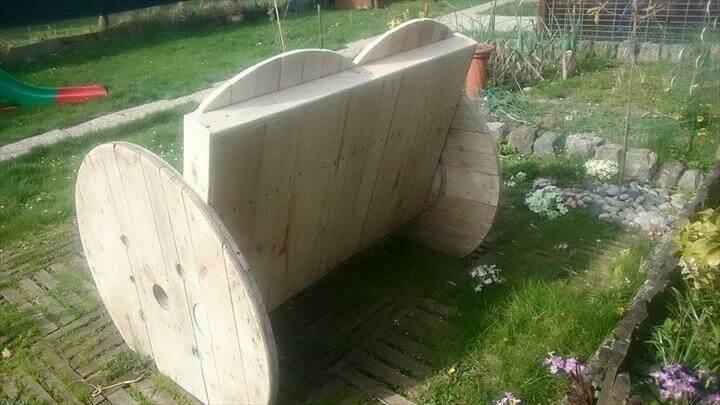 We are sure that you have never thought of such a creative treatment of a pallet board and an empty cable spool! 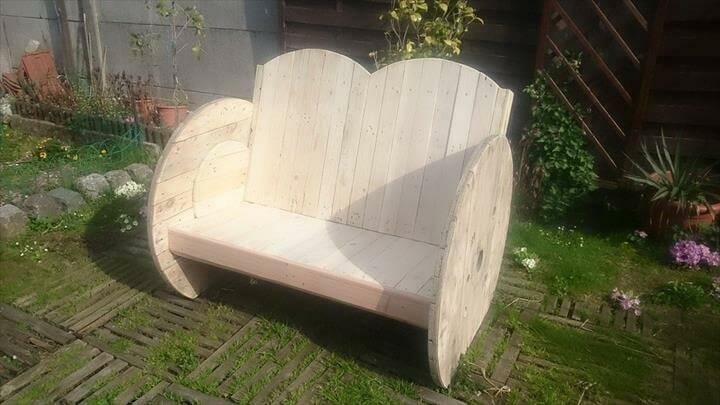 Removed wooden pallets slats got from pallet board dismantling, have been used to build up the berth and artistic barest for this bench while the spool wheels serves as both legs and armrests for the bench to sit back on it comfortably at any time! 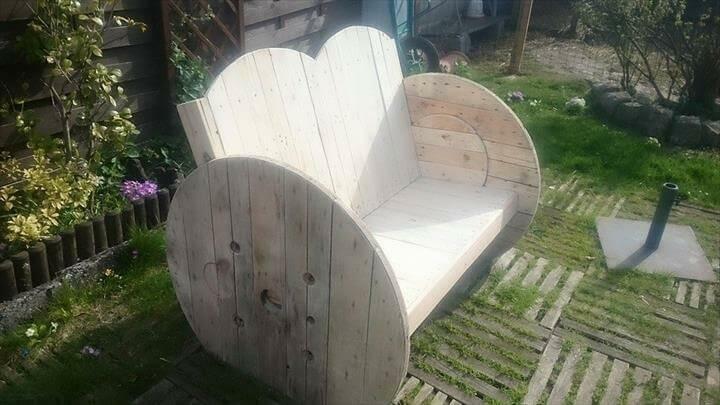 If you are having a strong intention for creative garden landscaping then this pallet bench can also be added to your to to-do list! To avoid rolling, a sharp cut has been given at the bottom of the wheels, double arched backrest is enough to hold your attention! Bench design is super comfy and eyeful, perfect to sit back for relaxing and daydreaming! Bigger wheels from a cable spool have been added to serve as legs and armrests at the same time! Have you every thought of such a creative ideas? now just rummage around to get some pallets and cable spools to clone it!